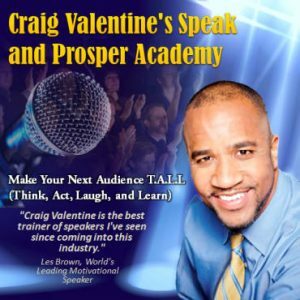 In this keynote, Craig Valentine will take you on his emotional journey to becoming the 1999 World Champion of Public Speaking. Along the way, you too will discover the 3 G’s to greatness and be empowered to use them in your life. Once you do, you will automatically start meeting with massive success in every area of your life. Learn to free up the potential that has been hiding in you and gain the confidence to take on any worthwhile endeavor. You will walk out of this program feeling like a champion and winning like one too!